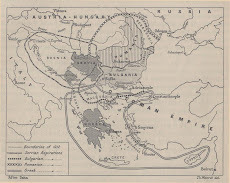 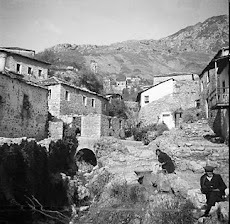 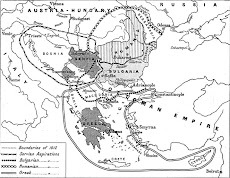 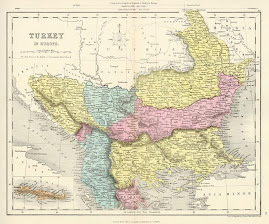 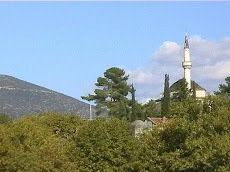 During the Conference of Ambassadors in London in1913, the southern part of the region was cut off fromthe motherland and annexed to the Greek state despitethe fact that people of the southern Epirus wereAlbanians of Orthodox and the Muslim faith. 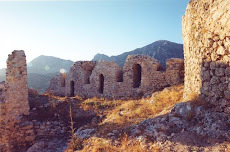 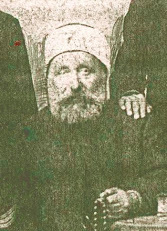 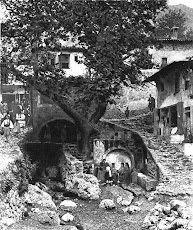 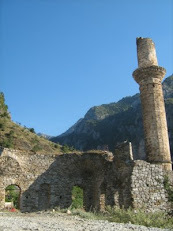 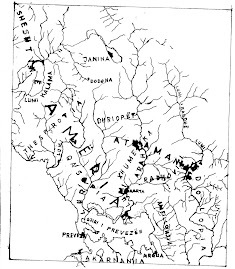 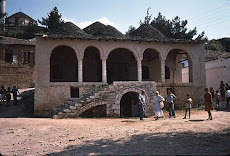 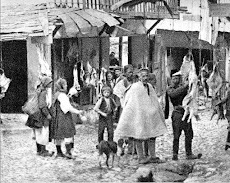 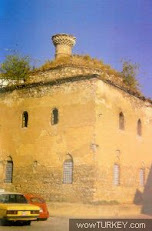 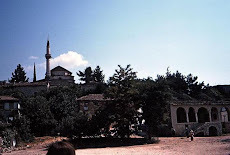 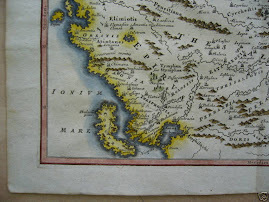 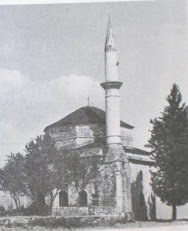 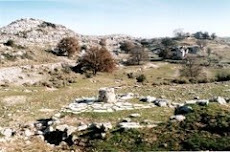 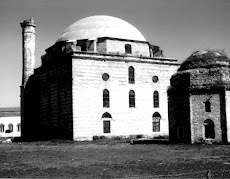 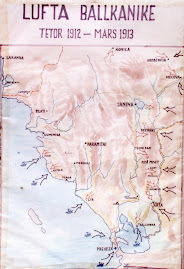 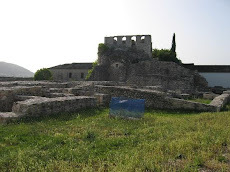 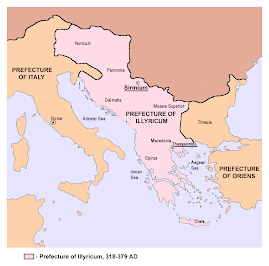 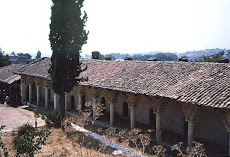 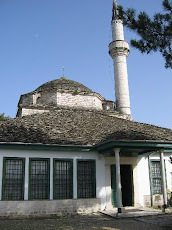 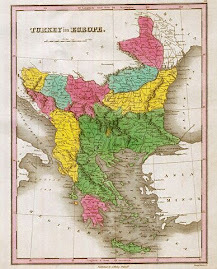 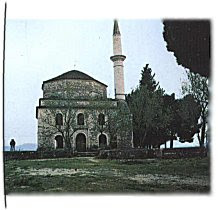 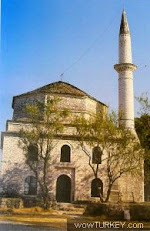 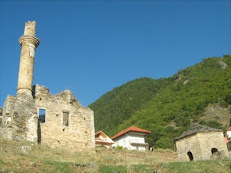 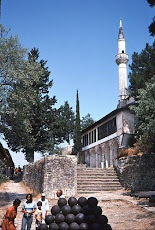 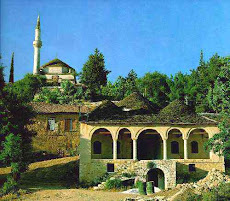 While theorthodox Albanians were targets of hellenization, themuslim Albanians were either exterminated or expelledfrom their ancestral lands by the Greek government.Chams who lived in Southern Epirus (Chameria orThesprotia as it is called by the Greeks) were thevictims of the first ethnic cleansing in Europe at theend of the Second World War. 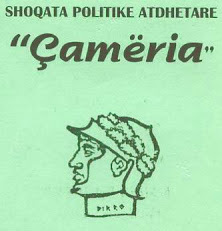 The Cham tragedy is oneof the most painful tragedies of the Europeancontinent. 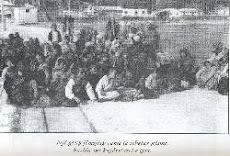 Statistical yearbook of the Greekgovernment in 1936 showed that 26.000 Chams lived inChameria region in Greece at that time.As a result of the 1944-1945 ethnic cleansing andgenocide, 30.000 Albanian Muslims were violentlyexpelled from the Chameria region, and sought refugein the Republic of Albania, where they still live.Today, there are 150.000 members of this population inAlbania, a figure that has grown because of the highbirth rate of the population. 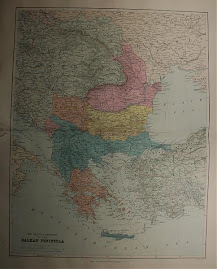 On the other hand,current number of Cham Albanians living in Greece isestimated at around 100.000. 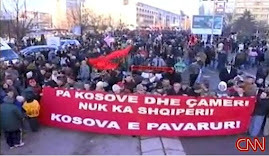 Yet these people aredeprived of every sort of minority rights like otherminorities living in Greece. 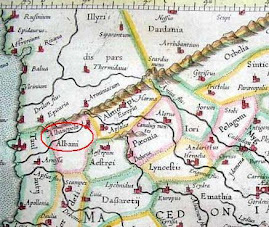 To cite but one example,they can speak Albanian only in their homes.The population of Chameria has always been ethnicallyAlbanian: - A lot of voyagers and foreign historianswrote that Chameria had been populated by Albanians.Even the Greek historian Herodotus underscored thisfact in his book Historias and called Albanians of theChameria barbarians, a term used by the ancient Greeksto distinguish non-greek people. 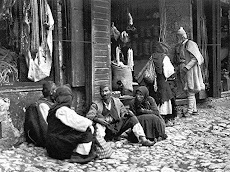 - The census held bythe Turkish Administration in 1910 established thatthere were 83.000 orthodox and muslim Albanians in theregion. 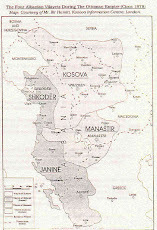 The demographic map of the British militarymission sent to the British government in Londonindicates that on the eve of the second World War, 75%of Chameria's population was Albanian. 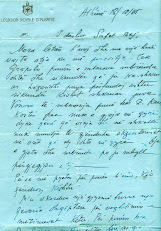 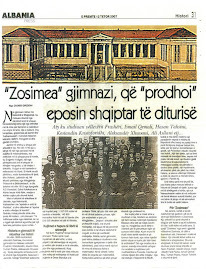 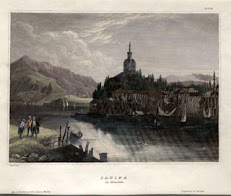 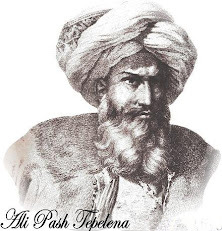 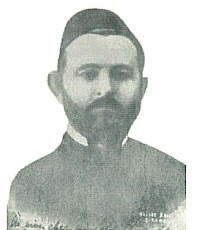 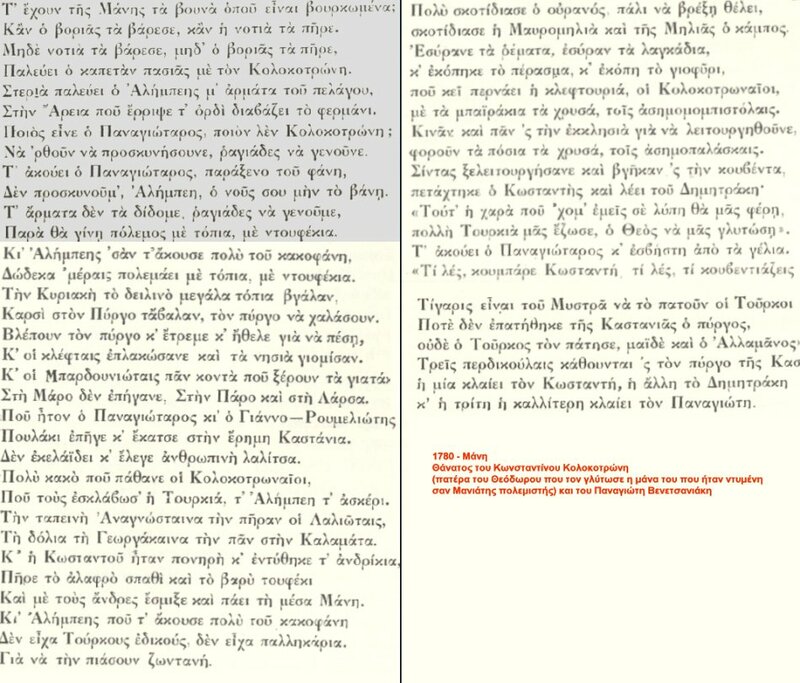 - The pro-Greekhistorian Spiro Muselimi, in his book "HistoricalSight Through Thesprotia", edited in Joannina on 1974,wrote that "The bishop of Thesprotia in the year 1870translated some parts of Bible into Albanian, as thepeople of orthodox faith of the region did notunderstand any word in Greek" .The Greek authorities, sticking to the concept ofabsolute denial of the existence of ethnic groups onGreek territory, have followed a well-establishedchauvinistic policy and, as history recorded, theycommitted genocide against the Albanians of muslimfaith. 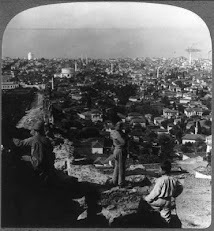 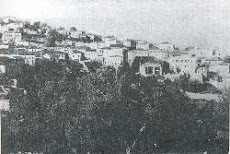 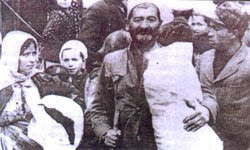 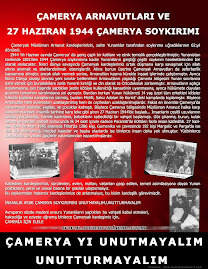 The racial assault on Chameria's muslimAlbanians began to be first applied at the end of theSecond World War, in 1944-1945, when criminal bands ofthe notorious General Napoleon Zervas perpetratedethnic cleansing against them.On June 27, 1944, Greek criminal bands resorted to theworst atrocities witnessed in this region. 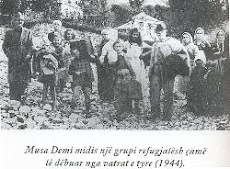 The terrorcommitted against this population was beyonddescription. 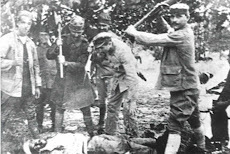 It included killings, rapes, inhumantreatment, massacre of women, babies and pregnantwomen. 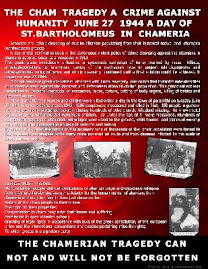 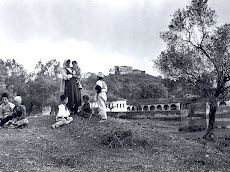 More than 1400 men, women and children werekilled within 24 hours in the town of Paramithy, onTuesday, June 27, 1944, which happened to be the dateof St.Bartholomeus day for the whole Chameria.During the June 1944-March 1945 period, 1286 personswere killed in Filat, 192 people were killed inGumenica, 626 persons were killed in Margellic andParga. 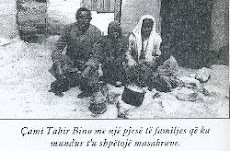 There were hundreds of other missing persons.In the same period, as a result of Greek massacres,acts of robbery and rapes against the Albanianpopulation of Chameria; 2900 young and old men, 214women, 96 children were massacred, 745 women wereraped, 76 women abducted, 32 children, younger than 3years were massacred, 68 villages were razed to theground, 5800 houses and places of worship were burneddown or destroyed. 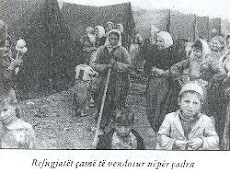 Furthermore, 30.000 AlbanianMuslims were violently expelled from the Chameriaregion who took refuge in the Republic of Albania.The Albanian government, after the war, took the Chamissue to the Peace Conference in Paris. 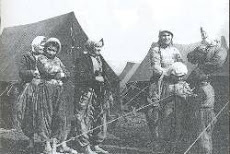 The conferenceof Foreign Ministers of the Allied Powers not onlyrecognized the very difficult circumstances the Chamswere subjected to, but also demanded repatriation andrecovery of their property. 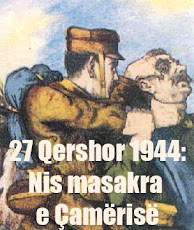 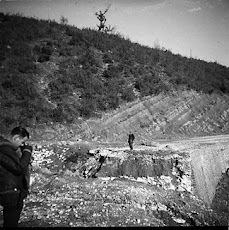 The InternationalInvestigation Commission of the United Nations,appointed for the verification of the tragedy on bothsides of the border, concluded its report in1946-1947, replete with facts and evidence about themassacre and painful tragedy of the Cham people.Realities of the recent history of Chameria requirethe attention of the international community. 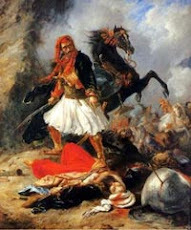 Greececannot avoid but recognize the genocide of the ChamAlbanians. 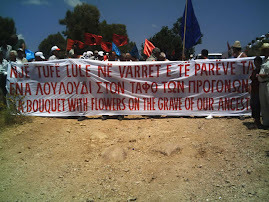 The civil and legal rights of thosecurrently living in Greece, estimated around 100.000today, must be respected by Greece. 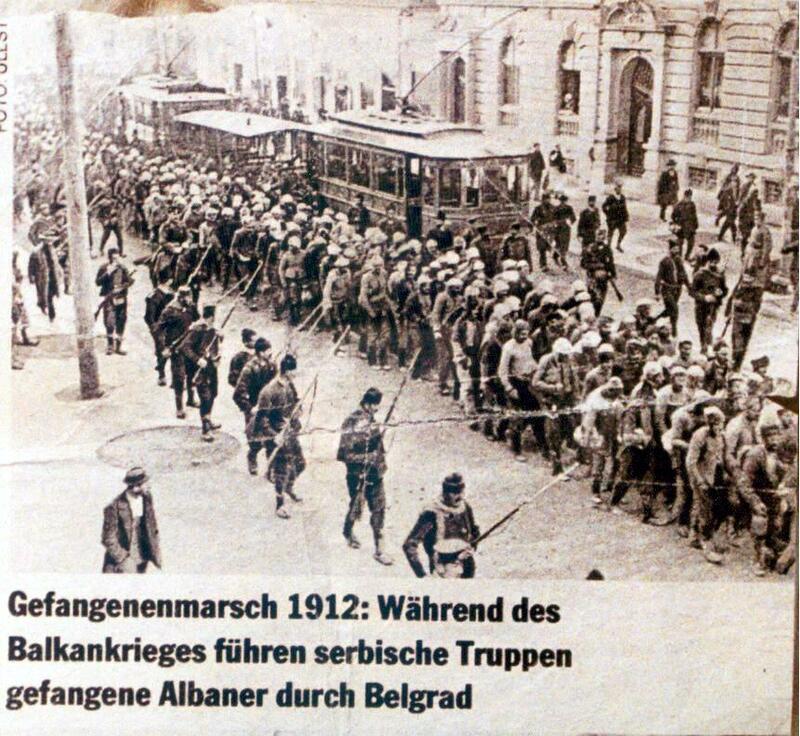 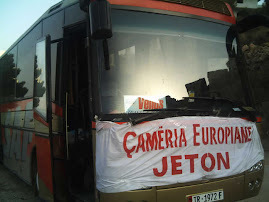 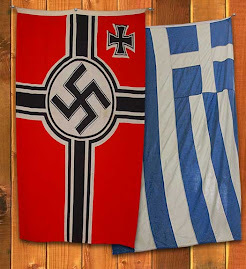 According to theofficial Greek stand, the muslim population ofChameria, which numbers around 150.000 and stillrefugees in Albania will never be allowed to return toGreece because they allegedly collaborated with theGerman occupiers during the Second World War. 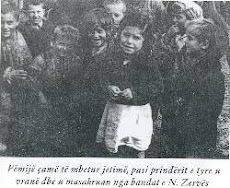 They areconsidered as war criminals according to the Greeklaws (K.Mitsotakis, Tirana, May 1992).This hypothesis is untrue and fabricated. 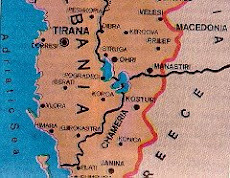 To considera whole community as criminals, many members of whichdied in Greece's liberation struggle in the SecondWorld War, is a political and historical crime againstCham Albanians. 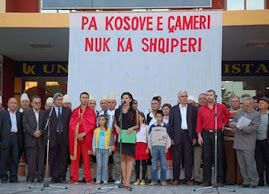 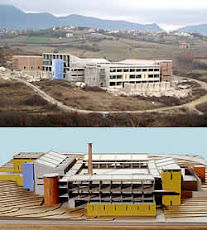 In 1994, the Parliament of theAlbanian Republic proclaimed 27 June 1944 as thecommemoration day for the massacred Albanians ofChameria, and a monument was built up in Konispol inmemory of the victims of Chameria.After 1945, with a view to changing the demographicstructure of Chameria, its colonization with Greeks,Aromens and Gypsies was begun. 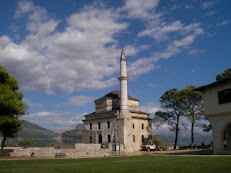 Greece wanted thedemographic structure of the province changed becauseit did not trust the rest of the Albanian populationwho remained there, even though they were of theOrthodox confession. 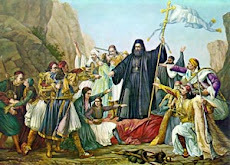 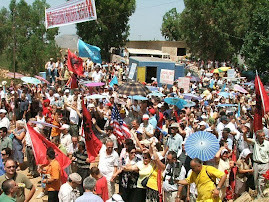 Greece violently put an end toevery attempt to preserve the identity of the Albanianpopulation of the Orthodox belief and Albanian wasprohibited to be spoken in public. 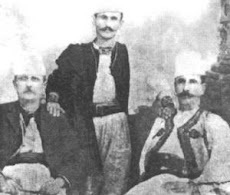 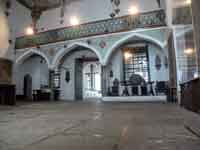 Thereby, theassimilation of orthodox Albanians gained momentum.The fate of the orthodox Albanians was not muchdifferent than that of their Muslim brothers when itcame to maintaining their ethnic identity.